5" heavily ruffled pink/lavender flower with deep purple edge, plum eyezone and contrasting yellow throat. 5" pleated pink self with chartreuse to green throat. And, a different flower on a different day with different lighting and time of day.... at 7am in the morning! So pretty! 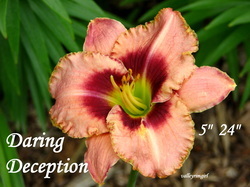 Wow, since it bloomed like this during its first summer, I am sure looking forward to this daylily when it is a full mature clump!!!!! 6.5" blood red with soft cranberry pink watermark, gold filigree, green throat. 6" cream blooms with hints of lavender, wide lavender-blue to violet-purple patterned eye, ruffled edges edged with violet, flared mid-ribs and a yellow green throat. Awards: Honorable Mention 2002, Award of Merit 2007. 7.5" deep purple with a large chartreuse throat. It is a UFO (unusual form) with long petals and an open spidery form. 5.25" coral salmon self above a chartreuse to green throat. Hightly ruffled edge with a ruffled texture to the petals. 4.5" very round and ruffled blood red self with a bright yellow throat. 3.5" mauve pink with a rose violet band above a yellow throat.